The only thing better than overnight oatmeal is an overnight barley breakfast bowl. How do you cook barley? Well, you don't have to when you soak it overnight. 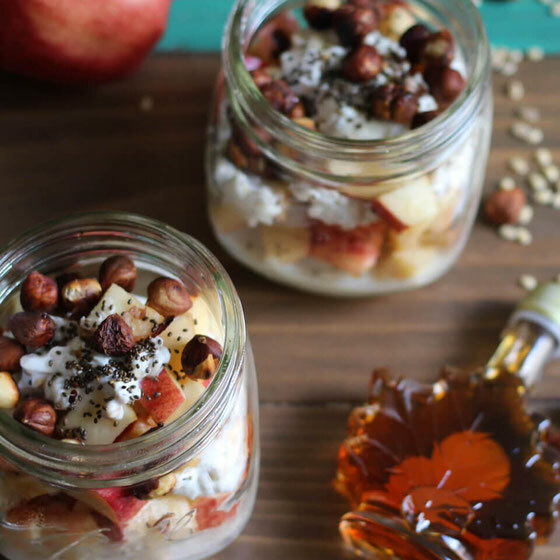 So go ahead and elevate your dish with maple syrup and chia seeds for the ultimate brunch menu idea. Looking to vary up your breakfast routine? 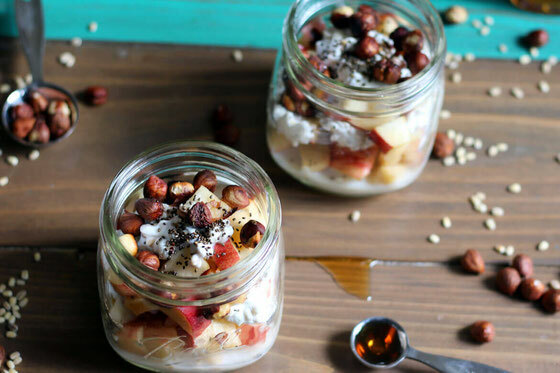 You have to try this overnight barley breakfast bowl with maple and chia seeds! It features loads of protein and fiber from a combo of plant-based and dairy ingredients—and it’s simply sweetened with pure maple syrup from Canada. Yum! Thanks to the folks at Maple Syrup From Canada for sponsoring this blog post. All opinions, as always, are my own. I’m a longtime fan of overnight oats. And while the breakfast staple is a delicious start to the day, I’ve been wanting to create a similar overnight cereal recipe with other breakfast grains. So I set out to do just that. You might be wondering how to eat barley for breakfast, but I'm about to tell you! This will be one of the tastiest barley dishes you've ever tried. I chose a very under-appreciated whole grain, barley. Barley has a chewier texture than oats. This is likely because its fiber content is found throughout the entire grain, not just the outer layer—and so barley is higher in fiber than other whole grains. It also offers more protein than many other whole grains, including corn, brown rice, and sorghum. So I combined barley with chia seeds (two plant-based sources of protein and fiber are better than one! ), along with plain Greek yogurt, milk, and maple syrup. 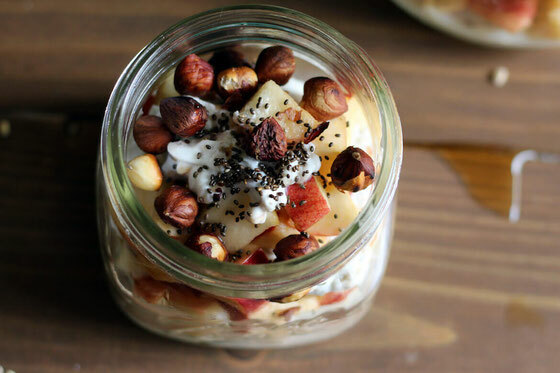 Then I layered the barley mixture in a mason jar with apple pieces—and placed everything in the fridge overnight for the barley to soften and the chia seeds to expand. So that's a quick primer on how to use barley in an overnight breakfast recipe! This meal tastes like a barley breakfast porridge of sorts. I’m all for cooking with minimal added sugar, but I really love the taste of maple syrup—especially as we get closer to my favorite season, fall! When sweetening my recipes, I prefer using pure maple syrup from Canada, versus table sugar, because it offers dozens of nutrients. Yup, that’s right! These nutrients include 60-plus polyphenols, which are health-helping antioxidants that form when the sap is boiled to create maple syrup. You also get the blood-sugar-helping mineral manganese, which helps to support healthy muscles, as well as the B vitamin riboflavin, important to the body’s cellular function. I included a minimal amount of maple syrup, just two teaspoons, in this recipe because I like to keep added sugar to a minimum. The American Heart Association recommends limiting added sugar to 2 Tablespoons (6 teaspoons) per day for women and 3 Tablespoons (9 teaspoons) for men. I could hardly wait to open the fridge the next morning to see how the recipe turned out! (Spoiler: It was delicious.) I quickly toasted chia seeds and hazelnuts on the stovetop, then topped my overnight barley bowl with the crunchy nuts and seeds. Note that I used a combo of white and black chia seeds in my recipe because I think the recipe looks prettier this way. You can feel free to use just one variety, if you’d like. 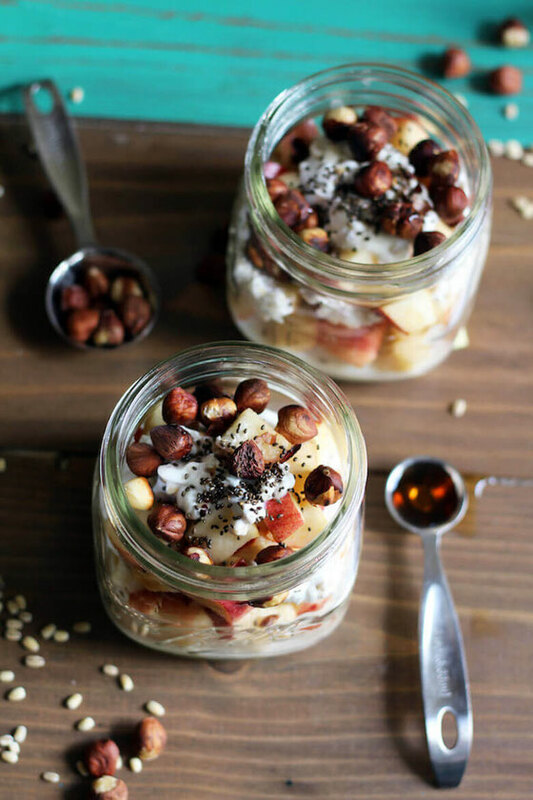 Now go ahead and make your very own overnight barley breakfast bowl! Combine barley, white chia seeds, yogurt, milk, and maple syrup in a small bowl. 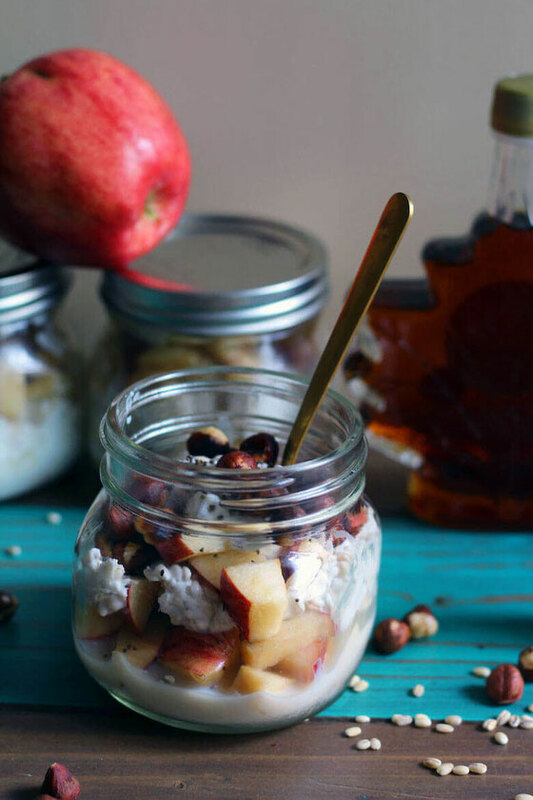 In an eight-ounce mason jar, layer barley mixture with apple pieces. Refrigerate overnight. In a small nonstick pan over medium-high heat, toast hazelnuts and black chia seeds for 3-4 minutes; toss occasionally. Top barley bowl with toasted nuts and seeds. Makes 1 serving. What are your thoughts on this topic? Will you make this overnight barley breakfast bowl? What are your favorite healthy breakfast ingredients? How do you cook with maple syrup?